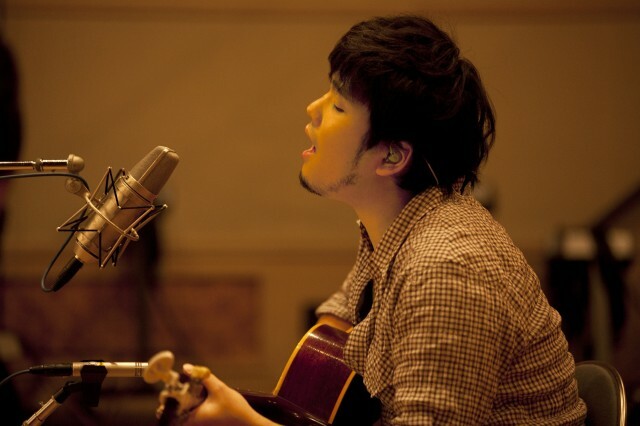 Hata Motohiro is a J-Pop singer/songwriter. Though Hata Motohiro was born in Miyazaki Prefecture, his father’s work brought their family to live in Yokohama, where he spent his childhood. From childhood, he has always been a heavier person. When he was in Middle School his older brother received a cheap guitar from a friend. After his club activities ended, he would come home and play the guitar energetically and singing along. In High School he tried to join the basketball team, but was too afraid of his seniors and instead joined the Music Club. From then on he was exposed to artists such as Mr.Children, Elephant Kashi Mashi, and the Wolves and started a cover band of these artists where he was the lead vocals and guitar. After High School Hata began composing his own songs for lack of better things to do. The summer of his admittance into College, he performed solo in a Punk-centric live house thanks to a friend of a friend called “F.A.D.yokohama”. From then on he composed earnestly and, after graduation, became interested in many sports. In 2004, Hata released his first Indies’ album titled Orenji no Haikei no Akai Hatsubai and had his first tour, which was considerably lonely. He continued to perform energetically, however.